The New Year is a chance to give your life a reboot, to clear out the old and make room for the new. While most people focus on resolutions to lose weight or better themselves, others tune their ears to the tune of the year’s emerging décor trends to give their homes that same makeover. So, what about you? Will you give your apartment for rent in Oakland a brand new look for the New Year? 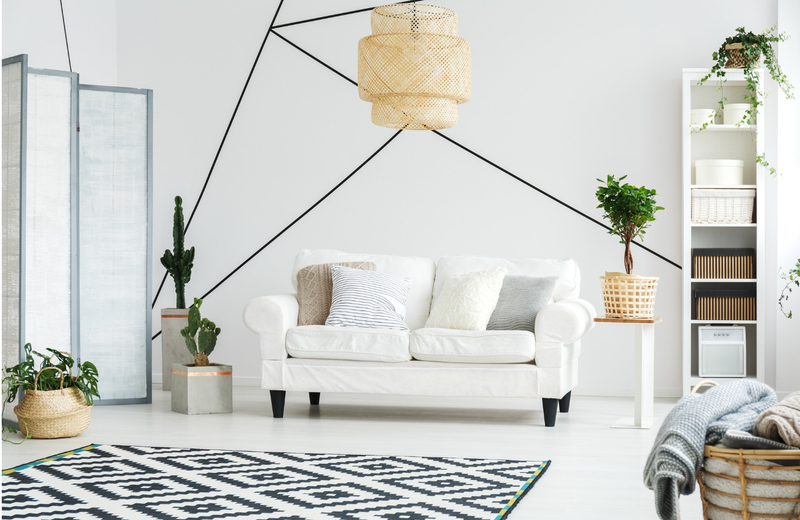 Redecorating your space can enhance your positive outlook on the year to come, and could possibly make achieving those resolutions a little easier. Changing your décor can bring in a new perspective and lease on life, lifting your spirits as well as inspiring creativity. Whatever your reasons are, here’s what’s in and what’s out in 2019. Florals are back in. Their traditional beauty can breathe new life into your home while lightening up your interior spaces. You can choose abstract patterns or traditional chintz. Either way, this will be a major pattern in 2019 from wallpaper to bed sheets and table side decoration. Geometric trellis patterns and ikats have outstayed their welcome. They’re overproduced to the point of becoming dull and mundane. Sure, they look nice, but it’s time to put this pattern to rest before your rooms start to look dated. Vibrant, rich jewel tones can make any space look like an artist’s haven. Emerald green, dark teal, and bold indigos give rooms a pop of life while working with neutral color schemes. Layer on these colors in your living, dining, and bedrooms by adding fabrics or accessories. Against a white background, they create dimensionality and drama. Neutral will never go out of style, but certain colors within that palette become rather boring when overused. Cooler grey tones are giving way to warmer browns and stark whites, which add a level of welcoming comfort to any room. Backsplash looks great in any kitchen, but bolder patterns are taking over subtle looks this year. Whether you’re a fan of colors or graphic tiles, make sure they stand out. This creates a larger impact in your kitchen, which can easily amplify a smaller space with mesmerizing pop. Terrazzo is a busy-looking material, which isn’t necessarily a bad thing. Homeowners are finding, however, that it’s an overburdened fix once they tire of the look. While that won’t matter in an apartment, it’s something to consider if you own your own house. Sustainable materials like jute, rice paper, and clay used in handmade pieces will be in for 2019. They provide a grounding element to the home, making it feel more in touch with the earth as well with your roots. Plus, they look fantastic with nearly any design scheme. These types of handmade materials have proven themselves to be too busy and loud in any home. People are searching for calmer environments in 2019, which the previous handmade materials provide. While you’ll still find these three materials around, they’re quickly on their way out. Specifically the poster kind, having these arms reach up and surround your sleeping space creates a sense of comfort and safety. This adds to the calm environment theme trending in 2019. Top decorators feel it is a sign of uncertain times, but maybe it’s just the way these beds seem to fill up space without actually doing so. There’s nothing wrong with a nice weave or fiber artwork somewhere in your home, but they’ve been overdone for far too long. The level of saturation in people’s homes is making them cheesy and cliché. Stick with one, maybe two, but never go over three. BOHO is making a comeback in 2019 with a vintage-modern twist. If you’re already familiar with this style, then stick with the layering of patterned fabrics. Then, add in curved furnishings and softer lines to complete the look. If your spaces are focused on a single design or décor style, it’s time for a change. Mixing styles is not only popular, but allows you bring out your individuality. Different woods, colors, and design elements can all combine to create a unique space entirely of your own creation. Acrylic provides balance in a room, creating a foundation that anything can be layered upon. These pieces aren’t flashy, resting quietly in the background while providing an excellent level of comfort. Plus, they allow for ample throw pillows that give the room a pop. It’s time for copper to go. Not only is it overdone, but it simply makes a room feel unnatural. Yes, copper is a natural metal, but it doesn’t look that way when it’s wound and bound into furniture. Soft carpets, comfy lounge-style chairs, and sofas that envelope you in coziness are all the rage heading into 2019. They create a sense of calm in any room by simply being there, wrapping you in a slight hint of luxury wherever you go within your home. New Years centers around the beginning of a new chapter in your life. For Oakland’s waterfront neighborhood, that new chapter is Fourth Street East. Two apartment buildings on one street from a unified vision of unlimited possibilities in the making. Offering comforts expected and unexpected, these luxe dwellings place you front and center in the vibrant Jack London District with the serenity of a waterfront home. Residence features ranging from luxury tubs with tile surrounds to private decks and French door refrigerators create a welcoming yet enviable interior. Smart Nest thermostats and light switches pair with MechoSystem roller shades to make living effortless, while kitchen islands and recessed lighting liven up your living spaces. A plethora of thoughtfully curated amenities cater to every facet of life. Residents can mingle in the fireside lounge or game room, stay active in the 2,000 square foot fitness center, or relax in the rooftop sky deck lounge. A co-working lounge allows you to bring your projects home, while electric car charging stations and transit screens help you manage life’s little tasks. Begin a new chapter in apartment living, one bathed in comfort and wrapped in luxury. Welcome to Fourth Street East.